It is with deep regret and sadness that the Health and Social Care Board (HSCB) learned of the untimely recent passing of our much loved colleague and dear friend, Jacqueline Magee. Jacqueline had 19 years’ service working in Health and Social Care (HSC) in Northern Ireland commencing employment in 2000. She worked initially as Disability Awareness Trainer for the former Southern Health and Social Care Board, where her formidable drive and zest for change resulted in the training of over 8000 health and social care staff across the Southern area in the early 2000s. Jacqueline was then appointed, as Service User Involvement Officer, the first of its kind in Northern Ireland, at the Southern Board based in Tower Hill, Armagh. Her work involved service users in designing and enhancing services, until she transferred to the HSCB in 2009 as Personal and Public Involvement Lead. She was also involved in the formulation, consultation and subsequent adoption of the first Service User Involvement Policy in Health and Social Care. This policy was instrumental in shaping service user engagement and involvement in Northern Ireland and culminated in winning the prestigious Health Service Management Award for Service User Engagement over a decade ago. Paying tribute to Jacqueline, the HSCB’s Director of Social Care and Children’s, Marie Roulston said: “Jacqueline was warm, compassionate, caring, a completely upfront lady and a highly regarded colleague to everyone at the Board. “Everyone loved working with Jacqueline, her humour, her determination, her kindness, her drive to make life better for others was unquestionable. “Jacqueline was an ambassador for all service users; she was an absolute character, and will be very sorely missed by everyone across the HSC system in NI. 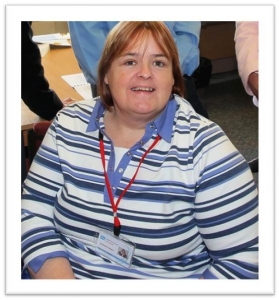 Jacqueline was known by everyone in the HSC family as a campaigner for all services users. She worked tirelessly for those with brain injury, wheelchair users, those with physical, sensory and learning disability and carers. 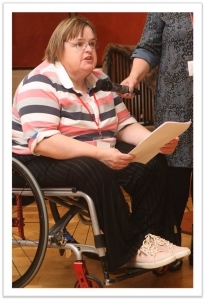 Jacqueline was instrumental in progressing all aspects of person centred planning including the Northern Ireland Wheelchair Review and the Review of Brian Injury to name but a few. Inside work or outside work her drive and enthusiasm to make a difference was evident be it with groups such as Vela Micro Boards, individuals or a wide range of charitable organisations including St Vincent de Paul, about which she was passionate. However, this work was often done quietly, without fuss, with no acknowledgement required. That said though Jacqueline also enjoyed being in the limelight and always looked amazing and relaxed in photographs, her smile, energy and enthusiasm filling the page. The challenge always for Jacqueline was to persuade others that her idea was a good idea. No personnel were beyond her reach when she decided that something needed to change. And it would be remiss not to mention her frustration and anger when others were not always on the same page as her – but there was always another strategy up her sleeve for more persuasive tactics. Her encouragement to others when the going got tough was also evident. Jacqueline’s interest and curiosity in things that she didn’t quite understand always drove her to question things. Her ever enquiring mind stretched to her involvement with the research and evidence agenda, something that took a bit of persuading for her to see its value and worth. A bit too ‘airy fairy’ or a bit too theoretical and esoteric was her initial view, and very alien to a person who wanted to get something changed NOW. But over time Jacqueline‘s understanding of the purpose, role and contribution of research and evidence increased. She saw the importance of making research and evidence accessible to service users. Our commitment to involve service users and carers in capacity building and involvement as equal partners in post qualifying training alongside social workers at Ulster University was something that she actively supported and advocated. More recently she adopted and applied research and evidence approaches in her own training initiatives of Involving People, Involving You and Coaching. Her contribution will live on. In recent years as the Disability Champion, the Disability Placement Scheme was launched in 2014, initially in the HSCB only but now stretching to eleven HSC organisations. Jacqueline was instrumental in getting this off the ground and over the years she worked with others to design, deliver, review and improve this scheme. Today the scheme is highly acclaimed and it was only a matter of time before Jacqueline would have driven health and social care organisations even further in the adoption of a full employment scheme for people with disabilities. Health and Social Care in Northern Ireland has lost a champion but everyone has lost a driver for change, who placed the voice and rights of the people first, especially those with disability. Our thoughts and prayers are with Jacqueline’s family and many friends at this sad time.